Australian winemaker Ben Glaetzer, descendant of German immigrants to the Barossa and Clare Valleys, has had a long list of wine awards come his way including New World Winemaker of the Year (2006), 12 awards at MUNDUSVini 2007, being chosen as Robert Parker’s Wine Personality of the Year (2005) and maker of Decanter’s Best Australian 2008 Red Blend, just to name a few. Originally named Godolphin for the inaugural 2004 and 2005 vintages, the wine was renamed Anaperenna from 2006 for trademark issues. The fruit for this wine is all dry grown – 75% from 85 year old Shiraz vines and 25% from 60 year old Cabernet Sauvignon vines. On the eyes, it’s a deep garnet with long legs. The nose is classic – all ripe blackberry, cassis and field berry with mint and dried herb, white pepper, leather saddle and crushed rock. The palate is dry with medium plus acidity and strained, subtle tannins. Flavours show rich and bright blackberry and field berry, eucalyptus, smoke and leather glove perched atop a sumptuous finish. Surprisingly, despite very high alcohol, it’s not hot at all but shows good balance and integration. Unfiltered and made with minimal sulfites, this is a WSET Very Good plus wine offered up by a kind and generous friend and opened at 10 years for a milestone birthday! 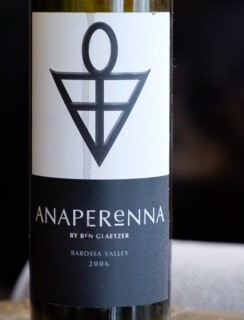 This entry was posted in Australia, Cabernet Sauvignon / Blends, OTHER, RED, Shiraz / Syrah and tagged 15% abv, 2006, Anaperenna, Australia, Barossa Valley, Ben Glaetzer, Cabernet Sauvignoon, Godolphin, red wine, shiraz. Bookmark the permalink.